Serving the dental health needs of Watkinsville, Athens and Oconee communities for two decades. Dr. Greg Ware and Team are delighted to introduce you to our Watkinsville dental office. Every day, we enjoy creating a fun, friendly environment so that even dental "chickens" feel comfortable here! Our focus is helping people understand their oral condition and guiding them through options to manage their dental health. We provide a wide range of dental services for children and adults, from routine cleanings and checkups to restorative and cosmetic procedures such as root canals, crowns, veneers and teeth whitening, or tooth replacement with dental implants, bridges or dentures. We invite you to contact us with your questions about your family's dental care or to schedule an appointment. General and Family Dentist Dr. Greg Ware has served the dental health needs of Watkinsville and surrounding Athens and Oconee communities for two decades. 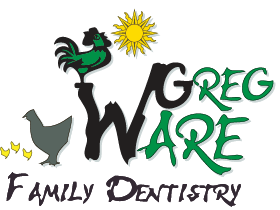 Over the years, Dr. Ware has become known as the "Chicken Dentist" because of his light-hearted, friendly and reassuring approach that is welcomed by his patients, even the most fearful. And, he also raises chickens and loves to share fresh eggs with his team and patients! Learn more about Dr. Ware. We appreciate your feedback! Please complete our patient survey.